The new “Shall we date?” series is out! A forbidden romance with a mononoke, a handsome humanoid monster! “Shall we date? 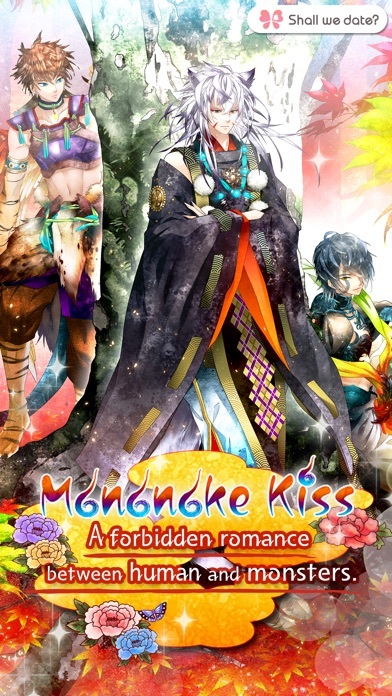 : Mononoke Kiss” is now available for women around the world!! 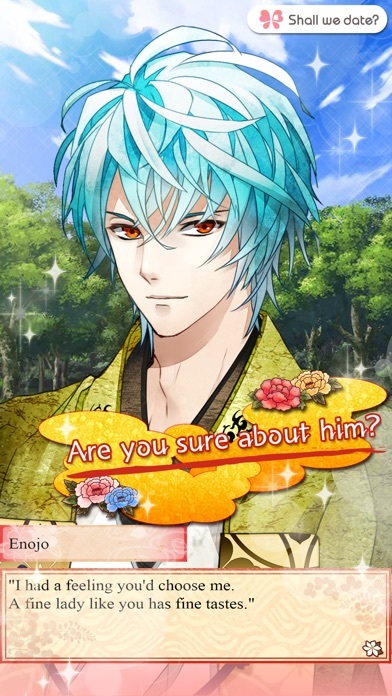 [Characters] Enojo -Humanoid Fox- "Are you asking me out? I'd love to!" Hajime -Humanoid Dragon- "Don't bother me, okay?" 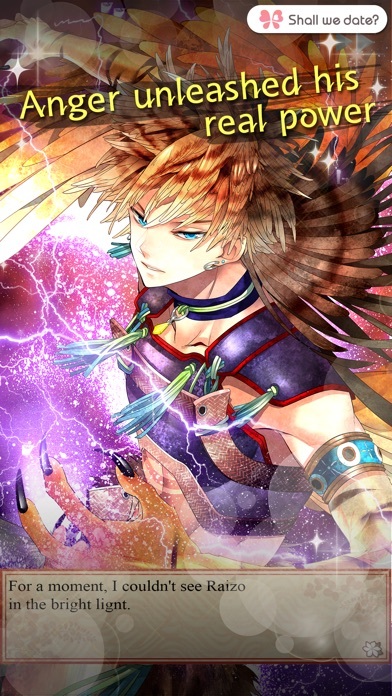 Raizo -Humanoid Beast- "I can't take my eyes off of you" [Features] 1.Wide variety of Endings Because the ending you get is determined by the answers you chose, you can enjoy 3 types of endings. 2.High quality pictures based on each character’s story You might choose an option which leads to a high quality image! Try to find them! 3.Mail from characters You may be able to see a different side of the characters!? [Story Introduction] Once upon a time… Mononokes (humanoid monsters) were living discreetly in human society. And my life as a princess was full of peace… One day, some mononokes attacked my castle! One of them said to me, “You must be Yuri’s daughter.” And he attempted to take me away. “What the earth is going on!? Somebody, help me! !” Then all of a sudden, four young men appeared in front of me. “Who are you? What’re you doing here?” Now, I have to choose one of them to escape from the mononokes. Two of them, Enojo and Hajime are reaching out their hands to me. Which one should I choose? Or should I run away by myself―which brings me to meet Raizo. [How to play] 1.As you progress in the story, you will get to choose answers. 2.You advance in the story by selecting dialogue options. 3.The ending will change depending on which answers you choose. *If you have ever purchased the characters by same Apple ID, there are unnecessary to purchase it again. Please touch the "buy" on the screen "Purchase". [What's a dating sim game? 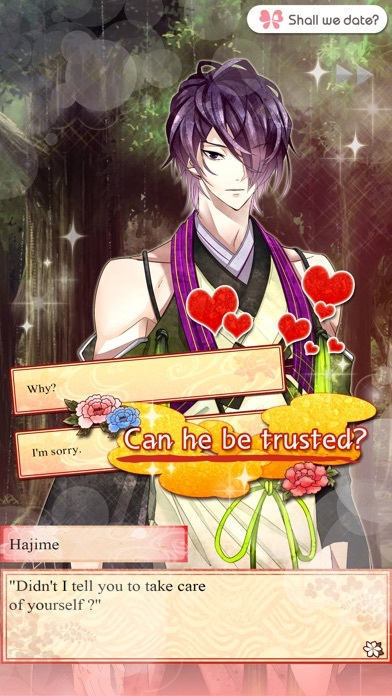 :otome games(japanese anime games)] Dating sim games is like a hybrid genre including romance novels and simulation games, which holds every girl's hearts! Dating sim games has multiple characters as your boyfriend, and endings which will change according to options selected by you. In addition, you will be provided with beautiful visual images. In Japan, Otome games has gained widespread fun from great range of ages, girls and ladies. Why don’t you play and feel this new type of romance? We’re sure that dating sim games will bring you a exciting experience! I really wanted to play this game but the game did not let me play the the game. I been trying to get the game to work by deleting apps & deleting the game so it can refresh but it's the same I did this for 1 year. I really hope that you fix this issue. Love the art, how the story lines split off well from each other, everything! What happened to the full on free version? Every time I open the app it doesn't work!!! Why??? I would give this five stars, but it doesn't have the option of buying all the characters the free version has. I would like to see those characters here too because I always forget what I read on the free version. So excited to start playing this; I love NTT's games. And ugh, Hajime is so beautiful! I really enjoyed it! There were some parts that were rather unexpected, but certainly not in a bad way. My Invitation ID is LADgkGh9u A good story and add if you want the side story.